Orthopedic surgeons have made steady improvements in total hip arthroplasty to improve safety and enhance surgical outcomes for their patients. As such, surgeons and patients have focused on less invasive surgical methods, at least for the past decade. This focus has led to an interest in, and to the development of total hip arthroplasty with the direct anterior surgical approach. 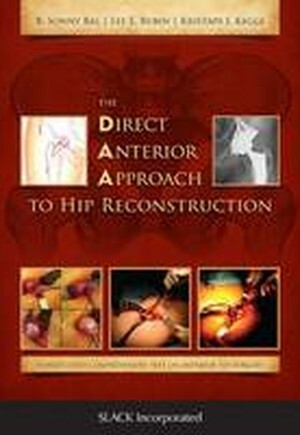 The Direct Anterior Approach to Hip Reconstruction is a definitive and comprehensive reference text that addresses the above interest. This resource is designed to help with introductory learning, intermediate technical development, and advanced revision skills using the direct anterior method. Drs. Sonny Bal, Lee Rubin, and Kristaps J. Keggi have joined their unique perspectives, along with those of a renowned group of experts in the expanding world of anterior hip reconstructions surgery to create this reference. Dr. Keggi was among the first to recognize and leverage the benefits of the direct anterior approach in hip reconstruction; his 40-plus years of experience as a clinician serve as the foundation for the text. The Direct Anterior Approach to Hip Reconstruction provides a stepwise progression for surgeons to learn how to perform total hip arthroplasty using the direct anterior approach, with detailed chapters and video instruction from an internationally renowned group of expert authors. The chapters are structured to focus on the art of using the direct anterior approach to address a variety of hip pathology, such as femoroaetabular impingment, pediatric operations, revision implant surgery, and others. The unique applications of the direct anterior approach within the fields of pediatrics, trauma, reconstruction, and tumor surgery are highlighted, along with chapters focused on femoroacetabular impingment, hip preservation surgery, and postoperative rehabilitation protocols designed to improve patient outcomes. The final section of the book reviews the evidence-based outcomes related to direct anterior total hip arthroplasty, addresses the evolving implant design concepts specific to this approach, and outlines directions for educating the next generation of residents and fellows who will continue to develop and refine these techniques. Complementing the written text is a website that provides access to educational videos to further enhance the learning experience. What Is Inside:* Basic concepts: Surgical hip anatomy, patient selection, and placement of incisions for primary total hip arthroplasty* Intermediate concepts: Adoption of imaging and navigation technologies, use of traction tables to enhance positioning, and presentation of unique instruments and custom devices that have evolved specifically for the direct anterior approach* Advanced concepts: Using the direct anterior approach for bearing and liner exchanges, acetabular revisions, and femoral component revisions To date, no other single reference has addressed a comprehensive education for the orthopedic resident, fellow, or surgeon seeking to learn about the direct anterior approach for hip reconstruction. This resource should be of value to orthopedic surgeons worldwide.